A Special Kind of Crazy: A Triathlon Blog: Are they done yet? Good solid day of doing stuff today. In stark contrast to last weekend, the weather was glorious this morning, so there was no stuffing around with the sessions, just up and straight out on the bike. The content of the bike session was very similar to last weekend, but the execution couldn't have been more different. For those who haven't read it last weekend I headed out for my long ride without any nutrition. I thought I would be okay, but I really, really wasn't. Absolutely fell in a hole. This time around I wasn't going to make the same mistake so I made sure I was carrying some gels. I don't tend to use gels when I race, but I sometimes do when I train, just because they are quick and easy to grab. I have been using the chocolate ones from Hammer recently and in this cold weather they really hit the spot. Like drinking a brownie. Having some fuel really made all the difference, so even though this week was more intense than last week, I finished the session still feeling strong. Much better. Just going back to the weather for a moment though. It really was very good this morning. This time of year you often get mornings when there are light winds, but I swear that this morning there was actually no wind. A little bit chilly, but not as cold as it first seemed. If anything I think I actually wore to many clothes, which is unusual for me. Just goes to show how nice the morning ended up being. As well as riding, the other training on the agenda was the Saturday afternoon Swim Smooth session. Sometimes this session can be a real lactic acid smashfest. But more often it is just a really good solid session where we practise some open water skills and do something a bit different. That was how it was today. A bunch of 150s were we practised drafting plus a bunch of other skills. The sort of session that you leave not necessarily feeling ruined, but happy that it was an hour well spent. The other thing of interest that I did today was this. 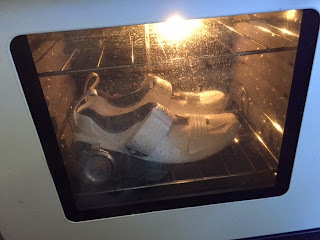 Yes those are cycling shoes in an oven. No this isn't an ill advised attempt to dry them out or the bizarrest birthday cake you have ever seen, these are my new cycling shoes. They are Bonts and the reason they are in the oven is that one thing you can do with these shoes is heat them up and mold them to your foot a little bit. We aren't talking total custom fit or anything, but heating them up does soften the carbon a bit and allow you to make them more or less snug around the heel or the ball of your foot etc. My current shoes have been on the way out for a while now so I have been on the lookout for a replacement pair. Everything I have read about Bonts says they are brilliant shoes as long as they fit your foot properly. When I tried these ones on they certainly felt good and they seem to fit my wide foot (they are a wider design). The fit and a whole host of other clever design features convinced me to give them a go. I haven't used these shoes yet, the plan it to try them tomorrow. Hopefully they live up to expectations. Speaking of tomorrow, brick session on the program for the morning. Hopefully the weather is as lovely as it was this morning.